The Cell and Particle Sorter and Imager is a high-throughput device, based on the “Venturi Cross” principle. The device enables the researcher to individually select, separate and reroute a particular cell or particle towards a designated flow path. Employing a “closed loop” system, with particles circulating between a reservoir and the sorting cross, this device is capable of sorting at speeds greater than 10 per second without loss of any material. (see CPD video). Other currently available particle monitoring and separating devices are slow relative to current HTS standards and they work on the principle of deflecting portions of the vertical (downward) flow path without recirculation. These parameters cause loss of valuable research material and lack the flexibility to adjust or pause the experimental process. 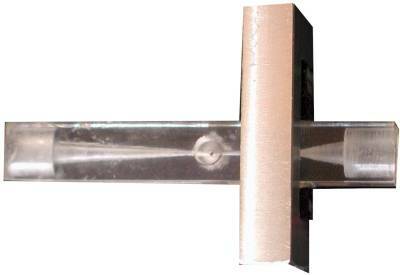 TechElan’s Cell and Particle Sorter and Imager is based on the "Venturi Cross" principle. Briefly, a horizontal flow of particles passes through a narrowing channel (Venturi tube), which is open to the cross flow of liquid or gas (See photo). The negative pressure, created by the horizontal flow, does not allow this liquid (with particles) to escape through the openings of the vertical cross channel. 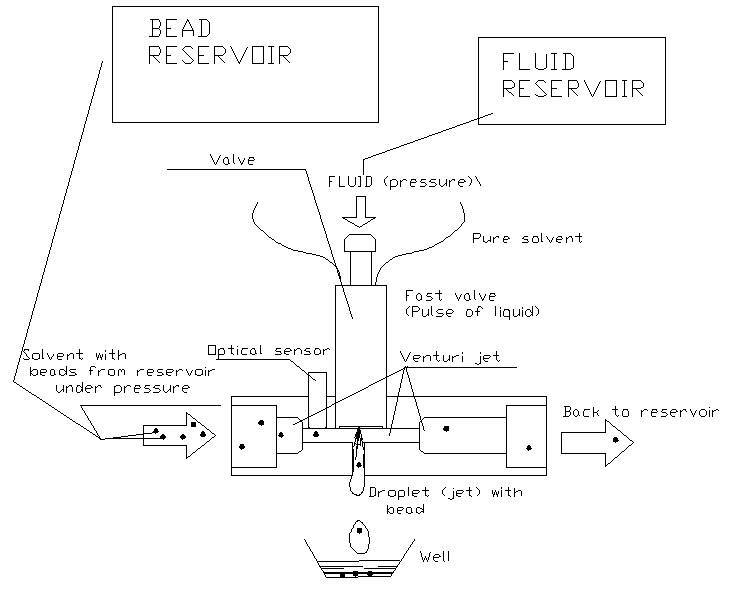 An optical sensor, installed immediately upstream of the "Venturi Cross", detects the particle (cell) with differentiating properties and triggers the opening of the valve at the top of the vertical channel. A vertical pulse of pressurized liquid (or gas) crosses the horizontal flow and deflects the selected particle (cell, bead) through the bottom opening of the cross channel and into the selected receiver. The process can be repeated at a very rapid rate, limited only by the response time of the valve (up to 500 pulses per second). The control system, interfaced with a particle imager, assures selection of the appropriate bead(s). The dispensation speed is dependent on particle properties and concentration. An automated particle (bead, cell) arraying system employs a standard advancing mechanism for rerouting particles into different reservoirs. Since all the components can be made with optically transparent material, (i.e. quartz, glass, etc.) it is possible to implement an “on-bead” assay system by introducing an UV excitation source upstream of a fluorescence sensor. Developmental efforts are currently focused to evaluate the efficacy of sensors and parabolic amplifiers for detection of single cell events. Please contact us for licensing opportunities and more information.